Agony in the Garden illustrates the poignant moments prior to Christ's arrest by the Roman's when he was praying in the Garden of Gethsemane with three of his disciples. 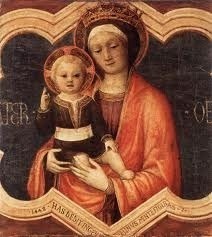 It is one of Bellini's earliest works on record and truly exemplifies his early style. Bellini painted tis piece in around 1465 when he was still a fairly young man and had probably only recently completed his apprenticeship in his father's workshop. Some researchers speculate that Bellini could also have been in the process of forming his own workshop around this time. 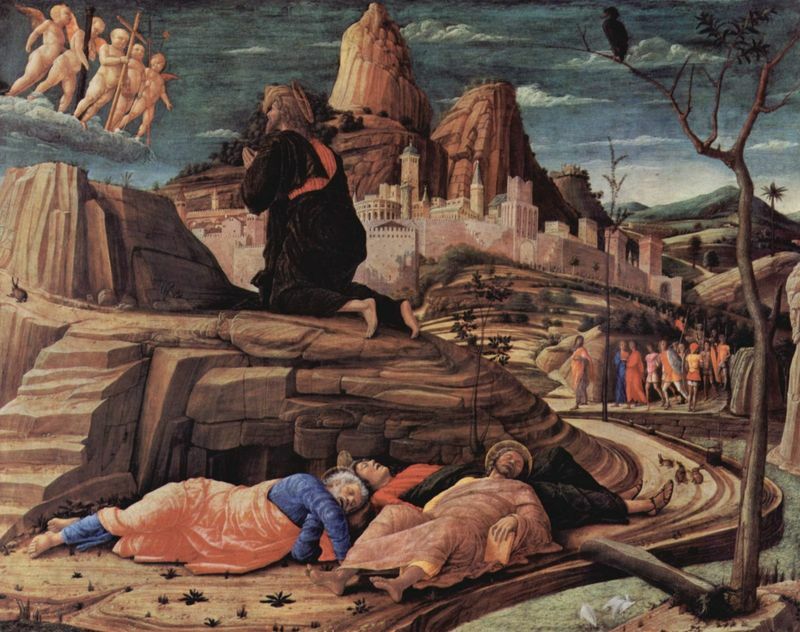 Something all researchers can agree on, however, is that this painting is closely based on Andrea Mantegna's own Agony in the Garden which was painted about five years prior to Bellini's. In a further act of collaboration, Mantegna's painting was probably based on a sketch by Bellini's father, Jacopo. Paintings of Biblical events were commonplace in Italy in the centuries prior to Bellini's birth and their popularity continued into the dawning of the Italian Renaissance - so much so that Bellini was commissioned to paint scenes in dozens of churches throughout Venice. Based on the Byzantine tradition of painting icons, religious paintings were meant to depict stories taken from the Bible so that the majority of churchgoers, who were illiterate, could see rather than read of the events. According to the four Gospels, Jesus walked out to the garden, located at the foot of the famed Mount of Olives in Jerusalem, to pray immediately after they celebrated Passover at what is now called The Last Supper. He asked three of his disciples - Peter, James, and John - to accompany him and pray with him at this place they often visited. Jesus moved a short distance away from his disciples and asked them to pray with him throughout the night. Twice, however, the disciples fell asleep and Jesus woke them up, asking them to pray for the strength to resist temptation. 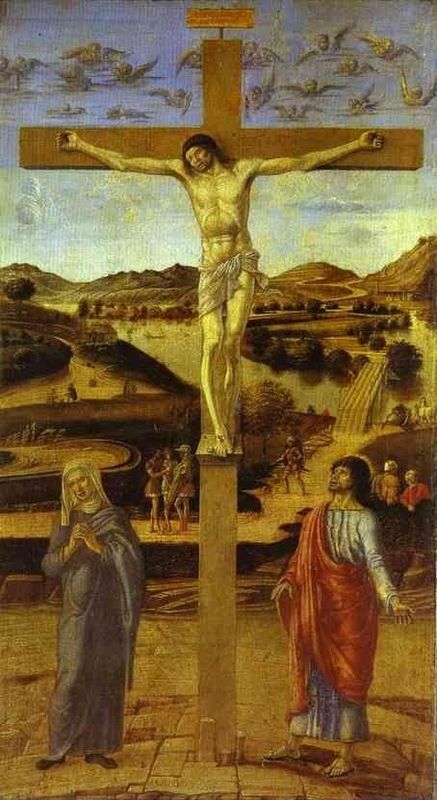 During his own prayers, Jesus is said to have been in a state of extreme anguish, such that "his sweat was as if it were great drops of blood falling down to the ground. " (Luke 22: 43-44). He asked God multiple times to "let this cup pass by me," referencing his impending betrayal and death. Each time he prays this, however, he says to God "but let it be as You, not I would have it," indicating his willingness to work for God's ultimate plan (Matthew 26: 42). He reveals to God during his prayers that "the spirit is willing, but the flesh is weak," (Luke 22: 43). In return, God is said to have sent an angel to comfort and strengthen Jesus. 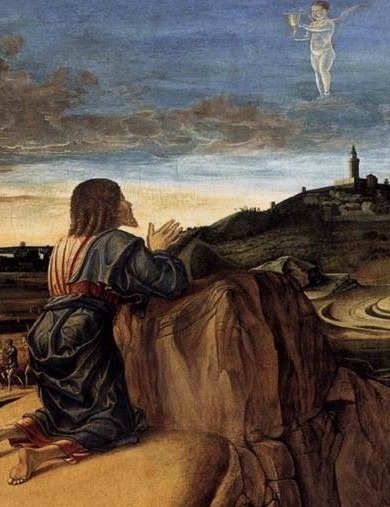 This angel is visible in the top right quadrant of Bellini's painting and is holding a cup to symbolize the looming sacrifice and that this cup will not pass by Jesus as he wishes it to. It is believed that after spending hours in prayer, Judas, one of Jesus' twelve disciples, arrived with Roman soldiers and Jewish religious leaders to arrest Jesus. According to Christian tradition, Judas had left the Passover meal they were enjoying in order to fetch Jesus' enemies. 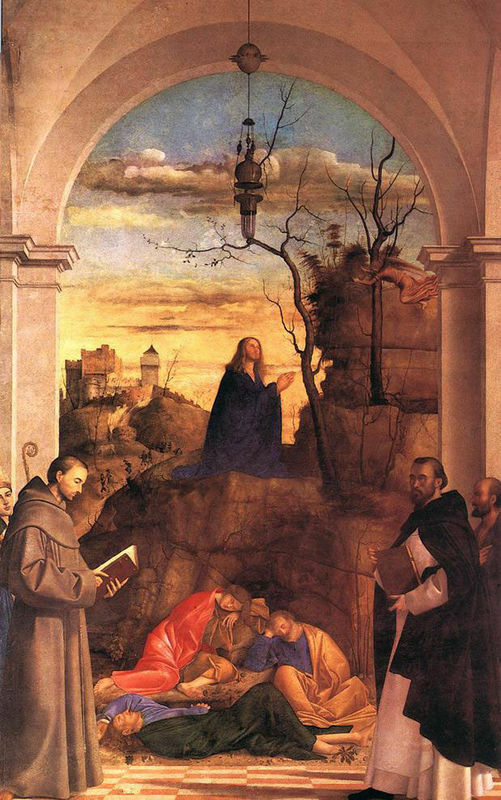 In Bellini's Agony in the Garden Judas can be seen in the background approaching with the cohort of people poised to arrest Jesus. The reasons behind Jesus' arrest were politically motivated. Jewish religious leaders, called Pharisees, were concerned by Jesus' popularity with the people and they feared that their own teachings and laws would come to be abandoned. The conservative Pharisees also feared that Jesus' arrival in Jerusalem would prompt another uprising against Rome in favor of an independent Jewish state. During this time, Rome occupied the area but allowed for local customs and laws to remain intact. There was a very unstable power balance. The Pharisees believed that with just another uprising, Rome would lose its patience with them and move to a complete take-over, thereby depriving the Pharisees of their own political and religious power. On a more personal level, the Pharisees had been embarrassed by Jesus during a few public debates, when, it is said, that he revealed the Pharisees' occasional religious ineptitude and exposed them as sinners, no better than anybody else. For these reasons, the Pharisees hired Judas to lead them and some Roman soldiers to Jesus' whereabouts, so that he could be arrested and tried for blasphemy and sedition in the Roman courts. In order to ensure that all aspects of the story were covered in his painting, Bellini included the approaching mob to remind those viewing the painting that the events don't end in the Garden of Gethsemane. After Jesus' arrest at dawn, tradition dictates that he was immediately taken to the Roman Prefect, Pontius Pilate who questioned him about his life and actions. Many scholars believe that Pilate was not convinced of Jesus' guilt and was reluctant to execute him and offered a crowed of gathered people the choice between Jesus of Nazareth and an insurrectionist named Jesus bar-Abbas (Barabbas). When the people chose to release Barabbas (no doubt after some encouragement from the Pharisees), Pilate authorized Jesus' crucifixion. In Bellini's Agony in the Garden this deep sadness is literally lightened by the presence of the hopeful light of dawn, which harkens to Jesus' foretold resurrection from death.